Episode 34: Today we tackle the single most important element that a story must have: Conflict. What is it? Why is it so important? And how can we get our stories brimming with it? I’ve noticed an odd thing in the stories of new writers. Often there are two characters that go through the story together. It’s kind of a buddy story. Or maybe it’s the story of a couple in love who go on an adventure together. Or a father and son surviving in the wilderness. Now, there’s nothing wrong with that at all, some of my favorite stories focus on the relationship between just two people. But what happens in these—I hate to say it—amateurish stories is that the two characters are almost indistinguishable from one another. They are such good friends that they talk, feel, and act the same. Or they are such a loving couple that they want the exact same things out of life, they have the same fears and the same hopes. I’ve read stories where you could literally swap the names of these two characters at any time and the story would hold up just fine, and sometimes their two names have appeared literally side-by-side throughout the entire story. Bob-and-Jim did this. Bob-and-Jim did that. These writers haven’t written a story with two characters at all. They’ve written a story with a single character named “Bob-and-Jim” or “Harry-and-Sally.” What’s going on in these stories is a fundamental lack of conflict. And, to a certain extent, a similar lack of conflict might be sneaking its way into our stories as well. Maybe it’s not as obvious as the kinds of stories I was just talking about, but it just might be there just in a more subtle form. I think we all get conflict on a major scale… the arguments, the chase scenes, the battle royale. But I think we all too often miss the subtle conflict that should permeate every scene and every relationship. I’ve said it before and I’ll say it again. Story IS conflict. And conflict only exists when there is tension. And there should be tension—or conflict—in every single scene of your story. Sometimes it’s big, life-threatening conflict and others times its subtle, under-the-surface conflict, but it absolutely has to be there. Any scene without tension—without conflict—is a scene that has no place in a story. It is, by definition, telling rather than showing. For that reason, it’s absolutely vital to go through your manuscript and amp up the tension wherever possible. Watch for moments when you have characters in agreement with each other, especially if they are agreeing on a deeper level than just making a similar decision. Now that’s a little ambiguous, I think. Let’s get specific to see how it works on a scene level. Let’s take, for example, two people going on an adventure. They might both be excited and eager to go. On the surface, they might seem perfectly in sync and ready for whatever comes to them. If this agreement goes deeper—to the level of their motivation for going on the adventure—then you have a boring pairing of characters. Now give your characters differing (and, even better, conflicting) motivations and watch the tension and opportunities for conflict rise dramatically. Perhaps the best example of this is the epic adventure of Frodo Baggins and his travelling companion, Samwise Gamgee. You’ll remember that there is some initial disagreement about whether or not Sam should accompany Frodo which provides some surface-level tension, but that tension is quickly resolved as the decision is made for him to accompany Frodo on the journey. But think about how their differing motivations provides ongoing tension in the story. Frodo’s motivation is a responsibility to destroy the ring and a commitment to his mentor, Gandalf. Samwise, on the other hand, goes because he loves and cares for Frodo, his friend. For most of the story, Samwise couldn’t care less about the ring. He just wants his friend to be safe. Even this seemingly innocuous difference creates compelling moments of tension and conflict. When problems arise, their differing motivations bring about conflict. Samwise would rather than Frodo give up the journey entirely and just go home to the Shire where he thinks they’ll be safe. This flies directly in the face of Frodo’s motivation. He’s not concerned about his own safety–or at least that’s not his primary motivation–and that causes conflict in the way the two of them handle obstacles thrown in their way. And here’s the kicker about conflict–the reason it’s so important. It’s by seeing how characters deal with conflict that we discover who they really are. People are not what they say they are, they are what they do. And seeing characters learn to react difficulty in the face of conflict is how we share that a character has truly changed over the course of our story. Now think about your story. Do you have characters that are in love? This is an invitation to storytelling disaster. If their motivation to be with each other is simply love, then you’ve got a recipe for bored readers. They both desire each other because… well… they just desire each other. Complicate it a little bit and you’ve got the makings of tension. This is why so many lovers are from different worlds, either culturally, socially, or socio-economically. The rich young bachelor and the girl from the wrong side of the tracks. Yes, they are in love. But there’s more going on than just that. Perhaps he is also wanting to use her as a way to get back at his overbearing and controlling parents who have pre-planned his life for him. He loves her, but she is also, at some level, a tool of revenge and rebellion. She, on the other hand, wants to show her family that she is more valuable than they think she is. They expected her to be a high school dropout, pregnant as a teenager, and amount to nothing like so many of her friends. Yes, she loves him, but he’s also the middle finger she wants to give her family as a way to show them that they’ve misjudged her. Now you have tension. Now you have two people who may genuinely love each other, but are also tempted to use each other in some subtle and pernicious ways. In other words, now you have the opportunity for conflict. It works on a much more basic level as well. Do you have a character who is walking along the beach, thinking over a major life decision? How could you ramp up the conflict and tension in a scene like that? There are no other characters, no interaction, and no obvious sources to have a run-in with. Even here you have a couple of options. The tension can be internal. Have the character pull up a memory that flies in the face of the decision they are trying to make or let an imagined conversation play out in their head with someone who disagrees with them. Or it can be external. The beach is closed and now he’s forced to walk along a crowded street clogged with tourists and chaos. Or there are sand mites that begin to chomp down on the character’s legs and arms and distracts him from his thoughts. Even these small moments of tension are enough to keep a reader interested and a scene moving. Why? Because they are all opportunities to learn about the character and see how they react to conflict. Does the character persevere while getting their ankles bitten or does he fly off the handle and react in some unexpected or violent way? That’s how your reader gets to know your character, and that’s how they bring themselves into your story. Subconsciously, they are asking themselves, “How would I react in a similar circumstance?” As soon as they’ve put themselves in the shoes of your characters, you’ve got ‘em. And conflict is the way to do that. For every scene in your story, ask yourself not “can I increase the tension?” but “how can I increase the tension?” There is always an opportunity for more tension and conflict, whether major or subtle. Now, in this episode, I’ve focused on stories and examples that use just two people. But the technique applies to stories with any number of characters. Your story could be a massive epic that involves dozens of characters spread out over generations. The same rule applies, but it just gets more complicated to sort out. Even in these cases, no two characters should be without conflict of some sort with every other character in the story world. I’ve seen people have success planning this kind of conflict by literally charting it out on a huge sheet of paper. They put a bubble or circle for each character with lines showing the sources of conflict between each of them. I like this technique because it forces you to confront the fact that you may have created characters who are basically different versions of the same person, with matching goals, morals, desires, and traits. It’s actually a great way to develop characters and make them stand out from each other. Often while doing this kind of work I discover the aspect of a character that ends up defining who they are and suggests and entire backstory. Let me give you an example. In the book I’m working on now, I have a protagonist who starts out very religious. In one scene, she is talking with her parson about the importance of faith. What I realized while writing the scene is that they were both in exactly the same place on the issue. Both were whole-hearted believers who didn’t question their belief. The scene wasn’t working because it was basically two people sitting around agreeing with each other. Boring, boring, boring. So I asked myself what I could change, how I could give it some element of tension. I knew that I couldn’t really change my protagonist’s position because it was a key part of her character arc in the story. In other words, she had to start the story all-in with her religion. But it occurred to me that the parson didn’t! That’s when things got interesting. I had to ask myself what it would look like for my protagonist to be talking with a parson who was struggling with his faith. Then the wheels started turning. I’m still fleshing it out a bit, but I began to brainstorm reasons that religious leaders might doubt their faith and, the one I’ve settled on at least for now is that his wife has left him for another man. So instead of my protagonist talking to a parson who believes exactly as she does, he’s actually playing the role of the person who is struggling with doubt? How could God allow such a thing to happen? he’s asking himself. Now, he’s not coming right out and saying that he’s struggling during their interaction, but it’s clear from the subtext of their conversation that he’s not on the same page as her and is trying to tamp down her complete reliance on faith. It’s subtle, yes, but it’s working a hell of a lot better than two people sitting around nodding their heads and each other. One word of warning before we wrap up today. Not all conflict is good conflict for your story. Don’t just throw in conflict for the sake of conflict. Make sure it stays consistent with your story, and with your characters. It’s vital that you keep tension and conflict realistic to the world and characters that you’ve created. In other words, to use an overly-dramatic example, don’t introduce a dragon in a work of realistic fiction just to spice things up. You’ll break your story. Now that’s something you’d probably never think of doing because it would be obvious how it would harm your story rather than improve it. But watch for the subtle ways that introducing inappropriate conflict can have a similar impact on the believability of your story. Conflict should arise naturally from the story idea, not come externally to simply drop a bomb into an otherwise boring scene. Make sure your character’s reactions to the conflict remain consistent with who they are, too. Don’t have your puritanic main character suddenly explode with expletives at something that is annoying him. It’ll feel forced and pull your reader out of the story. Look at every moment of tension as a learning opportunity for your reader. Each one provides a glimpse into who the character really is, because none of us are as real as we are in moments of conflict. In every other aspect of life, we can put up our masks and try to get the world to see us the way we want them to. In moments of conflict, though, our true selves cut through the facade and reveal the real person inside. If this thought makes you uncomfortable, it probably should. I don’t want to admit that the person I really am is the one who rises the surface when I’m cut off in traffic or when someone is talking loudly in the row behind me in the theater. Like it or not, these are the moments that reveal who we really are. And the same is true of our characters. If our use of conflict misfires and we have a character react in a way that isn’t authentic to them, we undo all the work we’ve done to help our readers get to know our characters on an intimate level. Use these moments of transparency wisely in your fiction and your characters will jump to life in all their positive and negative complexity. Now, characters can certainly act out-of-character at times, lord knows real people do it all the time, but make sure you’re doing it to build that character and show a new wrinkle to their personality that may have been hidden up to that point rather than create unrealistic conflict. 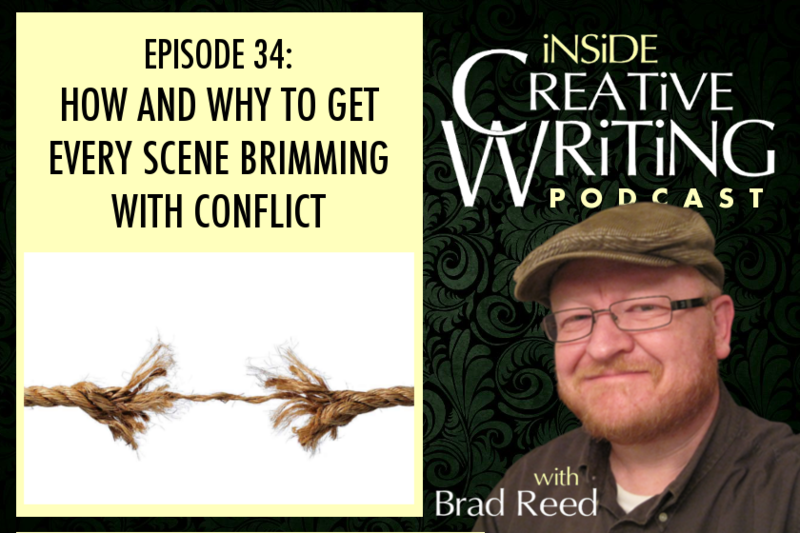 Conflict should grow organically from your story characters, story world, and plot lines. In fact, I think I’d say imbedding conflict into your story is more about discovering it in your story rather than injecting it into your story. Find those moments where tension can arise in the situation you’ve created. That’s what keeps the readers turning pages. I love the piece of that quote where he essentially says that character is built by struggle. Hopefully after our exploration today, we can see how that is true for the characters in our books. Hopefully we’ve filled out pages with the kind of struggle that can both reveal the qualities our characters lack as well as provide opportunities for them to build up their character qualities. But I also love that this statement is true for us as writers as well. It is through the struggle and conflict of writing a book— a massive undertaking—that builds up character in us as well. There is a kind of power in finishing a huge project like a book. It not only gives you the confidence and wherewithal to write another book, but that confidence bleeds into the rest of your life as well. Any project looks small and achievable when stacked up against the mountain of work and effort and struggle that your book represents. It’s just another way that writing is power. While you’re writing a story in which your character makes massive changes, you the author are changing as well. I love that. Our weekly challenge this week is, of course, related to conflict. Like last week, there’s a bit of danger in this week’s challenge, although it’s of a different sort than last week. This week, I want you to think of you and your best friend. Maybe that’s that lifelong friend you’ve known since high school, maybe it’s a spouse, or maybe it’s even a parent or a child. Who is the person who is the most “on your side” of anyone in your life. Who is it that you go to when you are needing advice or validation about the direction of your life. In other words, who is the person in your life that you would say you have the least conflict with? The person who is most in-line with you. Now, and this isn’t something you should share with this person, by any means, brainstorm a list of the conflicts that you have with this person. In what ways do you see the world differently? What are those things that you know not to touch because it could set off an argument? Try to get into the details here. In writing, it’s all about the specific details. Once you’ve done that, I want you to look at the two characters in your current work-in-progress that would be the closest in the same way. Look at their relationship and see if it has some of the same sources of possible conflict as your real relationship does. Not necessarily the exact same ones, of course, but similar KINDS of conflicts. This can often help you discover when you have two characters that are too similar in your story. If there isn’t enough that divides them, then there’s not enough to separate them in your readers’ minds and certainly not enough to provide the kind of tension and conflict that needs to exist between all of the characters in your book. Even the best of friends have conflict… in real life and in fiction. So that’s going to wrap it up for this week. I’d love to hear your experience with our weekly challenges—what’s working, what’s not, and what you’re learning about writing through doing them. Actually, I love to hear from you about any aspect of the show! Get in touch with us by going to BradReedWrites.com and clicking the Talk To Us link. You can shoot us an email, connect with us on Twitter, or even leave a message on our voicemail line and perhaps hear your voice on a future episode of the show! Until next week, remember the best way to improve your craft is by writing. That’s what I’m off to go do, and I hope you’re off to do the same. Let’s get some words on paper this week and we’ll meet up again next week for another episode of the Inside Creative Writing podcast!